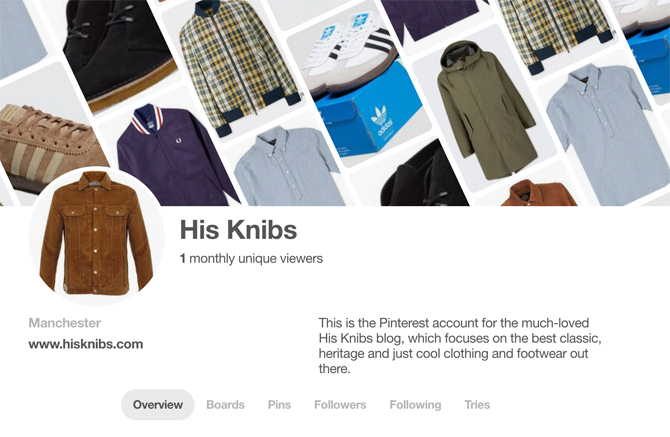 When I mentioned I was going to update the His Knibs site, one of the requests was to set up Pinterest for it. So I have just done that very thing. So if you have a Pinterest account or use it at all, please make a note of where His Knibs is, which is right here. Or if you want to just follow by name, it is hisknibsblog. I will be posting all the finds from the site on there and probably a variety of other images too, both clothes based and classic style shots. It’s a good place for that kind of thing. Anyway, I’ll see you there if you use it – or any of the other social networks. You will find links to all of them elsewhere on this page.